“The understanding or reason compares different objects, which operate as motives; the judgment determines which is preferable, and the will decides which to pursue. In other words, we reason with respect to the value or importance of things; we then judge which is to be preferred; and we will to take the most valuable” [link]. In pondering these words, we have a linear path to action that begins with reason. First, we must use reason to compare what is before us, second, we render a judgement, third, we exercise our will concerning our judgement which leads to action. 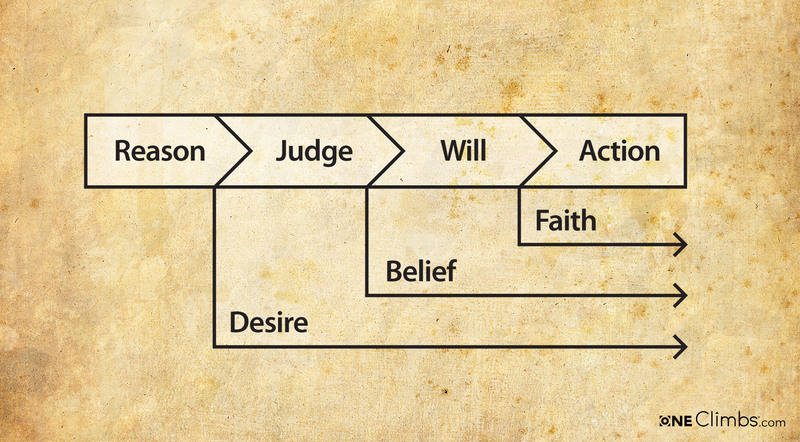 Now we can see how the principles of desire, belief and faith fit very nicely within this framework. Upon further investigation, we may be able to identify the potential origins of these principles. If reason leads us to pursue judgement, you will find desire there. Desire motivates us to make a judgement and then remains in existence to varying degrees and is the fuel to all following actions. In exercising judgement, we have the origin of belief; we have discovered enough evidence to state our belief that something is so or not. Desire and belief together fuel the exercise of will. Once will has been exercised, faith comes into existence. Desire, belief and faith together now have the power to bring anything, for good or evil, into existence. These principles might not sound very impressive until you consider what you are, or rather, what your body actually is. It is easy to see ourselves as a single body with flaws and shortcomings. Maybe you are young and maybe you are old, maybe your body is missing parts or is not quite the shape, volume or proportions that you would like. I’d like you to forget about all that for a moment and consider something that is rather astounding if you will ponder the implications. Now zoom a great distance closer and imagine that the nucleus of this atom is the size of the earth and you are standing upon it. You are now existing in something the size of a small solar system with the other atoms possibly appearing as stars in the night sky. This is not a metaphor, this is actually the nature of your physical constitution at this moment. Your body is literally a vast cosmos almost as incomprehensible as the vastness of the stars in the night sky. What makes this understanding even more incredible is the fact that you control the fate of this entire cosmos just by exercising your will. Your intelligence reasons, judges and when it exercises will, information passes somehow from the spirit to the flesh, manifests as electrical signals that pulse throughout the universe of your body causing vast systems of matter move through space. Your will changes existence. When you understand the magnitude of everything we will into existence we can understand why sin is such a big deal. On the other hand, visualize the true power of will we can exercise as children of the ultimate creator and why a governing a physical body, a micro-cosmos, is essential to the progression of our intelligence to the macro level. This is the power of faith as it is born through will. Faith moves the cosmos we are while great faith can affect matter outside our sphere and God’s faith affects every cosmos in existence. Perhaps as we come to understand these principles in our own being, we can better understand God and his will in the grand design. Want to cross-post this at RI?